This NAEM's 2015 EHS and Sustainability Software conference is being held at the The Westin Tampa Harbour Island in Tampa, Florida. NAEM has secured deeply discounted room rates at the Westin Tampa, which is situation as waterfront retreat in the heart of downtown Tampa. The room block at the Westin Tampa has expired. NAEM has arranged a extra room block at the Barrymore Hotel for $139/night. 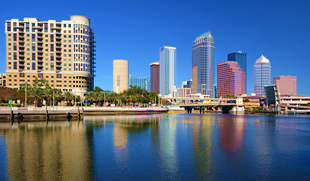 NAEM's 2015 EHS and Sustainability Software conference is being held in Tampa, Florida. With a host of unique dining experiences, leisure and recreational choices and venues like no other, there is much to discover in Tampa Bay. The hotels are about two miles away from each other, and both are located on the same trolley line. The trolley runs every 15 minutes during the periods of 6:00 a.m. - 8:30 a.m. and 3:30 p.m. - 6:00 p.m. The fare is $ 0.25 per trip. Looking at this map: http://www.tecolinestreetcar.org/about/maps/downtown_network.pdf the dark blue line represents the route of the ‘in-town trolley'. The Westin is at the bottom of the route, just south of the bridge onto Harbour Island, and the Barrymore is at the northern edge of the route. The trip takes 12 minutes. The closest airport to The Westin Tampa Harbour Island is the Tampa International Airport (TPA). The airport is about 10 miles away from the conference location. It is a 15 minute cab ride.